Community is at the core of the existence of public libraries. They’re an important hub for local communities and, in turn, become a community of their own, where people learn and share. Many libraries are safe, inclusive spaces where diversity is on display. If you are new to the area, or even to the country, libraries help you connect with your new community. If you are a member of a marginalized group, libraries can provide vital support. If you have a disability, libraries offer access to tools and services that improve your quality of life. What is a digital library branch? David Lee King is the digital services director at the Topeka & Shawnee County Public Library, where he plans, implements and experiments with emerging technology trends. He speaks internationally about emerging trends, social media, websites and libraries, and has been published in many library-related journals. David is a Library Journal Mover and Shaker. His newest book is Face2Face: Using Facebook, Twitter and Other Social Media Tools to Create Great Customer Connections. David blogs at davidleeking.com. 00:20 Patrick O’Keefe: Hello and welcome to Community Signal. The time is really flying by. In a little over a month, our show will turn one year old. We launched on December 14, 2015 [correction: December 7, 2015]. What should we do to celebrate that first year? Would you like to share something for me to read on that anniversary episode, perhaps what you like most about the show or what your favorite episode has been thus far. If so, please drop me an email via the website at communitysignal.com or send me a tweet @communitysignal. Community is core to the existence of public libraries. They are often a hub for the local community, encouraging people to grow and connect, which in turn means they have their own community that is managed both offline at their facility and online through their digital presence. My guest on this episode is someone who knows this better than anyone. David Lee King is the digital services director at Topeka & Shawnee County Public Library where he plans, implements and experiments with emerging technology trends. He speaks internationally about emerging trends, social media, websites and libraries. And has been published in many library related journals. David is a library journal mover and shaker. And his newest book is Face2Face: Using Facebook, Twitter and Other Social Media Tools to Create Great Customer Connections. David blogs at davidleeking.com. David, welcome. 01:34 David Lee King: Hey, thanks. Thanks for having me on your show. 01:37 Patrick O’Keefe: It’s so great to have you on. We were just talking before the show it’s been a while since we’ve spoken. 01:41 David Lee King: Yeah. 01:42 Patrick O’Keefe: Through voice but I had the honor years ago of speaking at Podcamp Topeka, which you organized. 01:48 David Lee King: That’s right. 01:48 Patrick O’Keefe: As well as the library and a team of volunteers. It was at the library, and there’s two things that I take away from that that I still tell people today. First of all, how nice the library was, how nice of a facility it was. I had a library as a kid that was very dark and people were mean. [chuckle] And I went to the library there and I was like, it’s really bright and people are nice. 02:07 David Lee King: That’s funny. 02:07 Patrick O’Keefe: I wish this had been my library. [chuckle] And the other thing was how well managed the conference was. I’ve spoken at a lot of events, some pretty big ones and most of them are at least fairly well-managed. But that event was so much fun and so well put together and such a good experience. And when people ask me about conferences and events I’ve spoken at, they know the best ones I’ve spoken at, Podcamp Topeka is still at the top of that list, so it was really a pleasure to come out there and to make it to the middle of the country and to speak. 02:35 David Lee King: Well, that’s pretty cool I think. ‘Cause that was the first time I’d ever figured out how to arrange a conference and run it. 02:43 Patrick O’Keefe: [chuckle] You did pretty well. 02:44 David Lee King: [chuckle] That’s awesome. 02:46 Patrick O’Keefe: And I love that it speaks to different communities and we serve different communities, but there’s this coastal bias that I guess I would look at it as East Coast, West Coast and how much stuff we have. And I speak at a conference out here, and it’s not a big deal like people don’t care. But people seem to be genuinely appreciative there to have an event at the library and to have people who were flying in or traveling to speak at it. Just the attendees in general just seem to be really appreciative of the conference, which I thought was really neat. 03:13 David Lee King: Yeah. I think that the group that we had, ’cause we had over 100 people I think when you were here that year, they came regionally. It wasn’t just from Kansas. It truly did pull from four or five states, plus a few way out there people who came like one from California and you, from the other coast. It was really nice just to gather in the Midwest ’cause you’re right, there’s not a lot of that going on. Usually, you fly to a coast or Chicago if it’s called the “Midwest”, it’s gonna be Chicago, right? 03:45 Patrick O’Keefe: You know, I never thought of that. I guess that makes sense. I’ve spent so little time in the Midwest. 03:49 David Lee King: Yeah. There’s a lot more to the Midwest than just Chicago, so it’s nice to gather more locally. 03:54 Patrick O’Keefe: Yeah. I’d love to come back again. I know you did the event I think it was four years or so, and I’m happy to have the bragging rights of the highest attended conference. 04:03 David Lee King: [chuckle] That’s right. 04:03 Patrick O’Keefe: What you did, we worked hard for that. And it was a really fun event, so hopefully I get another chance to come out there again in the future. 04:08 David Lee King: Yeah, that’d be cool. 04:09 Patrick O’Keefe: So you told me that you were “the first librarian to successfully turn a library’s website and other online channels into a digital library branch.” What does that mean? 04:21 David Lee King: Yeah. Well, I’m guessing I was the first or one of the early ones anyway. So most libraries and honestly, most companies back in the early to mid 2000s, were still thinking of their websites sort of brochure-like. This tells about the company, it tells about the library, maybe about the staff, about the stuff we have just a little bit. But to get the real experience of the library, in our case, you had to actually come visit the building. And I and the team here in Topeka wanted to really flip that around. So, my first title when I first started working here was digital branch manager. And so if you remove digital from that, I considered myself a branch manager, which that’s sort of the franchisee, the person who’s in charge of the building so to speak. My building just happened to be digital, not brick and mortar. And so because of that, we really tried to focus on having an experience in the digital library just like we do in the physical library. So, we have a real collection. 05:23 David Lee King: Well, obvious digital stuff like databases with magazine articles and e-books and that kind of thing. But one thing I really like to think about is that it’s the website. The digital branch is the only place where you can actually access the whole collection of books because at any one time, all our good stuff is checked out, unless we bought really bad stuff. And that’s the same way with other companies, too. I’ve seen signs in Disney store that says, “For more stuff to buy, go to disneystore.com.” You’ve seen a lot of those signs anymore at many different types of stores ’cause they’re getting that same idea, too. At any one time something might be sold out, but if you go online you can get everything they do. And for the collection, that’s what a library is too, so you can get everything online. 06:11 David Lee King: We have staff so if you have a question, like a traditional library you go up to the reference desk and ask a question, well you can do that online now too through online chat, through email, through Facebook or Twitter, texting. We have staff there to help you at your point of need. We’ve got a building, it’s just not brick and mortar, and real staff assigned to flesh that out, web developers, that kind of thing. And then, most importantly for your show, we have real community because people have to use our stuff, they have to interact with us, and hopefully they’re interacting with each other too through comments, or especially on Facebook if somebody says, “I love this book”, there’s a conversation that starts after that saying, “Yeah, I loved it too, here’s another one you should try out.” And at that point our job as a library is done because they’re connecting with each other and sharing interests on their own which is awesome, just like what happened at Podcamp Topeka or what happens at a program here, they’re doing that same thing online, so they’re achieving the mission of a library. 07:14 Patrick O’Keefe: When did you really start bringing that online? And did you meet with much resistance? 07:18 David Lee King: I started working here in 2006 when they recruited me to build that out, which is cool, and it took maybe a couple years; a year of planning and then probably about nine months to actually build the site how I wanted it, that was that incarnation. We’ve kept building since then. I did not get a lot of resistance, honestly, because this is a cool library. 07:42 Patrick O’Keefe: I can attest to that. 08:39 Patrick O’Keefe: And I can see how that might be a conflict internally at least because libraries are this great home for discussion and speech and learning and education. And then your website is obviously an extension of that, the digital branch. But then in a library you have certain standards. The most common one might be don’t speak too loudly, at least in some areas. So if you start speaking loudly, it doesn’t matter if you’re sayin’, “I love this place, it’s great!”, they’re gonna come over and they’re gonna ask you to, maybe politely, please quiet down. I assume there come moments where it’s like, “Well, this needs to go somewhere,” was that hard? Removing things and understanding how UGC works? And how sometimes you might have to delete something because of course someone’s gonna post something bad or negative. Was that a hard standard to establish at first? 09:25 David Lee King: Not hard, just something we had to really think through. I had to actually write up a community behavioral guidelines for the website and for our social media accounts and share that with couple of customers [chuckle] early on. That took a bit of time more than anything, just thinking through it, figuring out what other businesses did, ’cause at the time not really any other libraries had something like that, so I couldn’t just go to my other buddy website guys and say, “What’s your social media policy?” or, “What’s your commenting policy on your library website?”, ’cause nobody had them. So I had to go to other businesses and establish blogs and Flickr Community Guidelines at the time, that kind of thing. 10:09 Patrick O’Keefe: And the people who interact with the library online, as you kind of alluded to there, you see them face to face more than most other types of organizations see the people interacting with them online. A person who comments on your Facebook or who leaves a comment is way more likely to show up at the library tomorrow than any member of the communities I manage. So how do you think that changes the dynamics of those online interactions? 10:32 David Lee King: From what I’ve seen it’s a really cool, positive dynamic. I’ll give you an example from not fairly recently but when we we were starting out blogging a lot, one of our librarians shared a list of books or something like that and then over the weekend she saw somebody actually getting those books off a display and getting them ready to check out. And the librarian sort of tentatively went up and said, “Hey, I wrote an article on those books last week”. And the woman turned around, the customer turned around and said, “I know, I read it and I just came here to check those out ’cause of that.” So I think that’s the power and the positivity of having that community. To me it’s just a continuation, what you can do online after dinner when you’re at home can continue actually in the real building in picking up the stuff and interacting with staff that you’ve already seen online. 11:28 Patrick O’Keefe: I have to believe… And this will vary by different organizations, companies, their missions, libraries generally are gonna have a positive interaction with the people who use their services. But I have to believe that for the people at the library working on these efforts, who write a blog post or who post Tweets or respond to people on Twitter or Facebook, they can more easily and readily see that positive outcome by people coming in the library and saying, “Oh, I read this Tweet”, or, “Oh yeah, talked to you on Twitter”, or, “I’m using this hashtag”, and they can see now with people they actually physically occupy a space with. I have to believe that that can be very rewarding because sometimes it’s limited the work that we do online. Yes online conversation is beautiful, yes amazing friendships spawn. All of my best friends in the world I met online first. I totally believe in that but to be able to have those people come to the library on a regular basis and say, “That created value for me, that’s why I’m here.” That has to make people excited, to work on the online stuff. 12:28 David Lee King: Yeah, I think so. And I think one big difference from a library or maybe another non-profit versus a marketing copywriter at Dell or something I don’t know, some big corporation where their job is to turn out blog posts or something like that. They’re punching in, they don’t necessarily believe in the company mantra as much as maybe somebody who’s maybe not making quite as much money, maybe in a non-profit but they really care about what they’re doing. And that’s what I see with a lot of people who work in a library they purposely did not go the corporate route but they really believe in knowledge and sharing and information and community so much so that they’re working at one. And so what they write about they really care about and pour their heart into somewhat and so I would agree when a customer connects with that and interacts with it, it’s just that much cooler, I think. 13:26 Patrick O’Keefe: You mentioned people choosing to work in a library are pretty commonly choosing not go the corporate route but it’s funny I was thinking about this before the show and if librarian working in libraries it’s one of those positions that equips you with a lot of skills that work well in community building, in online community work. There’s Jessamyn West obviously is someone who’s respected in the online community space, especially for her work in MetaFilter, also a well known librarian and blogger. So it’s funny because a lot of community work, even online community work, even community manager work, a lot of organizations tie it to offline so even if they weren’t necessarily working online as much but they were organizing meet ups of X number of people every week for seven years and this was the result et cetera, they’re building some skills that depending on where they apply and what the role wants might actually translate to one day making that change if they so choose. 14:22 David Lee King: Oh, yeah very much so. I’ve often thought the skills I have, they can so many different places. It’s the same with anybody who works in a library because they’re very community connecting, communication focused and research oriented, what company doesn’t do that right? 14:40 Patrick O’Keefe: Yeah, no doubt, no doubt. So the library is currently active on Facebook, Twitter, Instagram, Flickr, YouTube, Goodreads and as you mentioned has some UGC on it’s website. I saw book reviews on the catalog myself. You talked about the team working on this so what does that look like? Who is responsible for this social UGC online and digital engagement efforts? 15:01 David Lee King: Oh, that’s a good question… Me. So how it works here as digital services director part of my job is website and social media type of stuff. We divide that up into a team-based approach. So for our Facebook page we have a team of probably about 14 staff who are assigned days of the week. I am assigned and doing a poor job right now, but I’m assigned Saturdays with another staff member who thankfully is rocking it on Saturdays. We have two people assigned everyday and they’re tasked with looking at our content calendar to get ideas for a post, maybe posting a few other things as well. We try to have about four or five posts a day. Answering questions that come up, funneling any really weird ones to me and our marketing director, we will answer those with a more informal version of the answer, that kind of thing. But they’re sort of babysitting the site for that day. With Twitter we do a similar thing, it’s more like a team of six or seven people. Instagram sort of the same way. YouTube we’ve just started a video team fairly recently because if you go to Twitter or Facebook right now what do you see? You see a lot of videos right? 16:15 David Lee King: So we decided well we probably need to do more in that space. So we’re gonna have a team of people and we’ve got about three videos being figured out right now just to start us off. That’s how we do it with our online more website-based content. Well we’re a pretty big organization, we’ve got 220 staff. And so, like our public services department, they might be in charge of the business pages on our travel blog and stuff like that. So the more static pages they write or more often our marketing department will write, and then the public service, like the reference librarian will be the one who will maybe look at it again in six months and just to make sure the content’s still accurate, hasn’t changed, make sure the links work that kind of thing. And with blog teams, which we have quite a few blog teams as well, they’ll set a schedule and say, “We want to post once a month or once every two weeks,” or whatever and then the team leader or just the team itself will figure out who’s gonna write that week and write a blog post. We haven’t gotten to the point of saying, “Well that’s scheduled at Tuesday at three o’clock,” but we wanna get closer to that. 17:24 David Lee King: And then my role is to lead those teams and just sort of check in with them once in a while to make sure everything’s going like it should, to head off problems before they happen… Sometimes we have somebody who wants to write perfectly valid legitimate content but maybe something that doesn’t work at a public library quite as much so we’ll refocus that, say, “Here look at our content calendar there’s some good ideas there.” And I’ll just try to keep that ball going, planning out the website two years down the road figuring out what’s next with social media or Facebook changes or that kind of thing. I guess the newest thing for us is this video team I’m getting off the ground because of all those changes happening in the video world right now. 18:35 David Lee King: Yeah. Very very much so. They have to okay it with their supervisor and most likely they’re working at a service desk or driving a bookmobile around town and they have to have the time to be able to do it. We’re all really busy here so that’s hard to get but if their supervisor approves it and I say, “Okay. Yeah, it’s just gonna take like 5 minutes a week or an hour a week to do this certain thing.” We work that out in advance, we give them some training sometimes we have a writing for the web class to get more of that conversational community-building type writing going and let them go. 19:10 Patrick O’Keefe: Yeah, we hear people talk about the idea that your employees are your best social advocates just like your place the library really isn’t an example of that. 19:19 David Lee King: Yeah, very much so. 19:21 Patrick O’Keefe: People talk a lot about safe spaces these days especially online. What is a safe space? What isn’t? And you know I was thinking about libraries and how a lot of people do in fact consider them as a space or a refuge. Why do you think that is? What is it that libraries do to encourage that? 19:38 David Lee King: We do a couple of things to encourage that. And just in general and hopefully this translates to our websites and our social media efforts as well, we are very neutral, that’s a scary word in the political climate right now, right? 19:50 Patrick O’Keefe: It is. 19:51 David Lee King: That’s probably a good example because we do have an election page up right now. It covers everybody and just basically shows customers where they can go to vote and if we went further than that we’d maybe link to all of the candidates and say, “Here’s all the information, have fun, knock yourselves out.” So we don’t take sides, not like a newspaper declaring for one candidate or the other. We’re very neutral that way, our goal is to say, “Here’s all the stuff go vote,” rather than, “Vote for this person.” We do that with all of those types of topics, we wanna be very neutral and you know, have information in the library, books to check out about whatever the hot issue of the day is and have both sides of it, and then the other thing that we do that not everybody does it’s this concept of equality of access, everybody should be able to use the library. 20:46 David Lee King: Not just the rich people or not just the poor people or not just a certain race or whatever. We’re here for everybody and so we have to work really hard to make that happen. One example of that right now just… You’ve heard of digital inclusion, actually mentioning Jessamyn West, she’s big into that. We’re starting some pushes. We just opened up a computer lab and a community center connected to a public housing authority apartment and condo complex. So those are really low income people that need access to information because if you think about it, if you’re applying for jobs right now I think you said, you do that online these days, right? 21:28 David Lee King: You can’t fill out the paper form and walk it in there anymore, they would say, “That’s nice you need to fill this out online, you need to email it to me.” Health information, it’s online. School stuff, it’s online. In fact most of the kids and most of the high schools around town they either get an iPad or a Chromebook these days, they need Wi-Fi access to make this work when they’re not in their school buildings and so we’re trying to provide that for people that can’t necessarily come to the library if the bus ticket doesn’t get you there at the right time. That’s a hard job to do, but we’re trying to do, we’re trying to make a dent in that. So back to your question. Those two areas, being neutral and having that idea of equality of access are two things the library has and not everybody has. 22:18 Patrick O’Keefe: Is that something that you find that you have to defend as a library and organization, I mean what are the threats to that, right? 22:24 David Lee King: Yeah. 22:24 Patrick O’Keefe: What are the threats that like you don’t… Okay I don’t want these people to have access I guess that’s a threat like I don’t want these people to have access because X, because they don’t make enough money or because they’re too rich or because they are this race, to borrow from your examples there. Or I want the library to have an opinion, I guess that could be the other thing to defend against for the being neutral, like I want the library to have an opinion on X, sort of come out and condemn X. You know what are the threats to that do you think? 22:50 David Lee King: You know I don’t think there are a ton of direct threats to that, like you said I was gonna say no those people can’t use the library, but there are indirect threats. Cutting funding for example there’re lots of libraries… My library not so much thankfully, but a lot of libraries go through that quite a bit and they have to defend the reasoning that they need the $500,000 or $2 million or whatever it is and why they need those staff and if you cut the money then you cut all those things that the library’s doing. And so yes comes into a very direct threat, but you wouldn’t think of it that way necessarily. 23:30 Patrick O’Keefe: And if those people who control the funding have an agenda then that’s real threat, right? 23:34 David Lee King: Right, and that happens quite a bit. 23:37 Patrick O’Keefe: Yeah I was reading an article at publiclibrariesonline.org it was Community-Centered: 23 Reasons Why Your Library is the Most Important Place in the Town. And something they mentioned, you know libraries as community centers for diverse populations, and a couple of the points in that article were that, one libraries help to ensure that non-English speakers see themselves as represented in their communities. So public libraries are often a first stop or an early stop for people who have recently moved here, maybe aren’t strong speaking English or don’t speak English. And they make those people feel comfortable. Another example is people who are LGBT and how some libraries create programs for them or make them feel more comfortable. The New York Public Library is cited as an example here. Libraries just in their very nature seem to be very inclusive and like a lot of things, you mentioned the political season [chuckle] perfect example. People with certain agendas against certain groups wanna control how things go and how things work out. And that impacts what they donate to and whose campaign they fund. And money is a great thing but I guess as the saying goes also the root of all evil and that touches on libraries. 24:44 David Lee King: Yeah. It really does and honestly I don’t get it sometimes. Just because everybody’s got agendas or issues they care one way about that not everybody has the same opinion on, but I’ve always thought with the library, if you want your voice to be heard, make doubly sure that everybody else’s voice is heard. Because then yours will be on the shelf right with everybody else’s. But if you start trying to yank certain things off, why can’t all the groups come in and yank the things off they don’t like? And then what do you have? You have an empty building all of a sudden. 25:17 Patrick O’Keefe: It’s a great point because libraries do encourage this great diversity and viewpoints as you’ve alluded to. And banned book weeks [chuckle] for example, right? These books are banned, someone wanted to stop these books from getting out there. Well, here they are. And at the same time, as we talked about, have this reputation for being a respectful place for learning. So I think everything you’re saying really speaks to that. 25:38 David Lee King: Yeah. 25:39 Patrick O’Keefe: Knowing your background, David, you have this amazing library experience, the… [chuckle] Well, whenever I think of anyone in digital and libraries, I think of you. 25:47 Patrick O’Keefe: But also you have this great crossover group that you’re connected to because you speak at conferences like South by Southwest and you interact with techie people. And I’m sure some corporate community and social people. For people listening in to this show, community pros who are listening right now, what do you think is something that they should take away from how libraries interact with the communities they serve? 26:08 David Lee King: The one thing that I can think of is, and this will sound sort of weird and backwards but, don’t be scared of your community. And don’t be scared of what they might say. Well, even libraries sometimes are. I certainly know with social media, when I do talk at library events and stuff like that and say, “Oh, we’ve got a Facebook page.” There’s always a library… A public library that’s maybe controlled by their local municipal government and they’ll say, “Yeah, our city attorney won’t let us have Facebook or our own website even, or Twitter or make a video.” or something like that. Usually because of it’s not under their control and anybody can say anything to them, right? And I’m like, “Yeah, why is that bad?” Then I help them through the issue. But a lot of organizations, even corporations and small businesses and stuff like that, are sometimes afraid of what they might get. They tend to play “What if” a lot and say, “What if 20 customers say, ‘Well, this new coffee shops’ coffee tastes horrible! '” I’m like, “Okay, the answer to that would be make your coffee better. Gee whiz, you just got great feedback on a product, make it better!” Right? 27:25 David Lee King: That’s awesome, positive customer interaction. I help them through that process but I think that there’s a ton of value in what your customers… In what your community, no matter what that is, whether they are customers or constituents or hobbyists or whatever, there’s great value in what people say, both positive and negative and just the conversations that they have with each other to build the community up and a share knowledge. I think that’s all good so we need to work harder as community managers to build that into everything we do. I know physically in a library setting, a lot of libraries right now are getting rid of bookshelves so we have more community space, so we can have those types of conversations physically in the building. It would be pretty cool to do more of that online as well. Even with different organizations besides libraries. Just because of the value of that. 28:31 David Lee King: Well, yes. Yes exactly. If they have nothing to say, you’re doing something wrong. 28:36 Patrick O’Keefe: David, it’s been a pleasure. Thank you so much for coming on the show. 28:39 David Lee King: Yeah. Thanks for having me, it’s been fun. 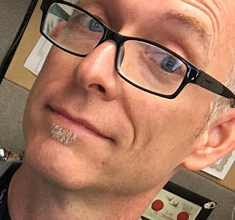 28:41 Patrick O’Keefe: We have been talking with David Lee King, the digital services director at the Topeka & Shawnee County Public Library in Topeka, Kansas. Visit his website at davidleeking.com. For the transcript from this episode plus highlights and links that we mentioned, please visit communitysignal.com. Community Signal is produced by Karn Broad and I’ll see you next week.